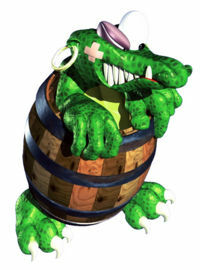 Klobbers (also referred to as Kremlings (in a Barrel) in the Donkey Kong 64 Prima Games guide) are Kremling enemies who wear a barrel for a disguise, and their first appearance is in Donkey Kong Country 2: Diddy's Kong Quest. Klobbers have a variant wearing a TNT Barrel instead, and they are named Kabooms. In Donkey Kong Country 3: Dixie Kong's Double Trouble! and Donkey Kong Land III, Knockas served as the replacement for Klobbers. Klobbers are green-skinned, have a light green belly, and black eye (as shown from its purple eyelid). Klobbers have small ears, and each one has a large hoop earring pierced into them. As shown in their official artwork render, Klobbers have a patch on their right cheek. In most of their appearances, the barrel worn by Klobbers are missing both the bottom and top lids, although in Donkey Kong 64, the top lid is placed on Klobber's head. As Klobbers move around, they carry their barrel around with them, and only poke out their head and feet. Klobbers stick their feet out from the bottom of the barrel. They have three big toes, each one sporting a large claw-shaped toenail. A Klobber in its titular level, Klobber's Karnage, in Donkey Kong Country 2. 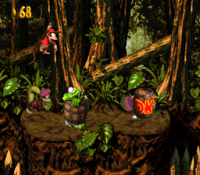 Klobbers are common enemies in Donkey Kong Country 2: Diddy's Kong Quest. From a distance, Klobbers look like an ordinary barrel, as they are hiding inside the barrel. When Diddy and Dixie approach a Klobber, it reveals itself and runs after the Kongs, attempting to repeatedly knock into them. Unlike most enemies, this does not injure the Kongs directly, but it can lead them into being pushed into a pit or another harmful obstacle. As Klobbers move around, they make a similar noise to the sound of tires screeching. The Kongs can make a Klobber temporarily stop and retreat inside of its barrel by either jumping on it or throwing something at it. If the Kongs are quick enough, they can grab the Barrel before the Klobber re-emerges from it, and use it just like a normal Barrel. By tossing the Barrel, the Kongs destroy it, defeating the contained Klobber in the process. Aside from Kabooms, there are two additional variants of Klobber: yellow ones and gray, red-eyed ones. They share the same traits as ordinary Klobbers, although the yellow ones cause the Kongs to drop a Banana Bunch each time it rams into them, while the gray ones cause them to drop an Extra Life Balloon for each hit; the Kongs have to quickly recollect the items before they disappear. Both the yellow and gray Klobbers appear in the later levels and appear less frequently than green Klobbers. Gray Klobbers are even less common than yellow ones, and mostly only appear in the Lost World levels. There is even a Lost World level named after Klobbers, titled Klobber Karnage, and all three types of Klobbers appear throughout. 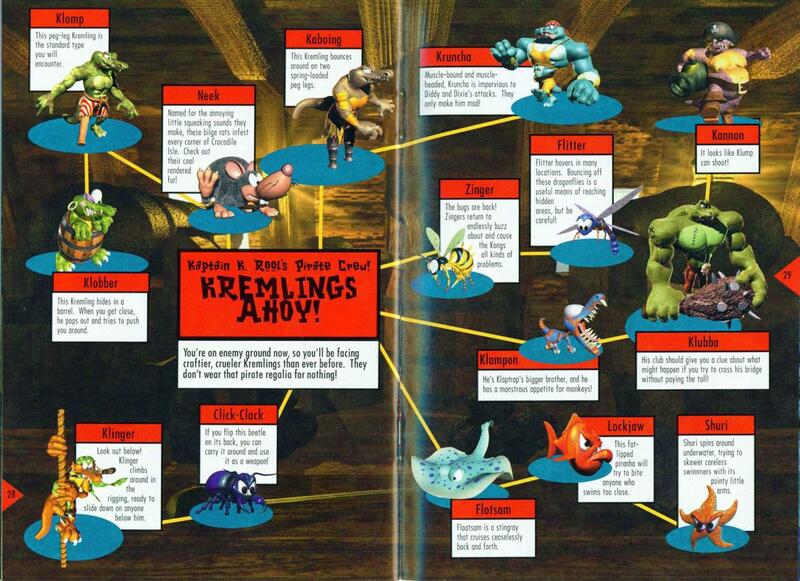 In the end credits, Klobbers appear appear under the "Kremling Kuthroats" enemy class. Klobbers make their second appearance in Donkey Kong Land 2, where due to the Game Boy's limited color palette, they are not featured in color varieties. As such, all the Klobbers in this game act like green Klobbers. 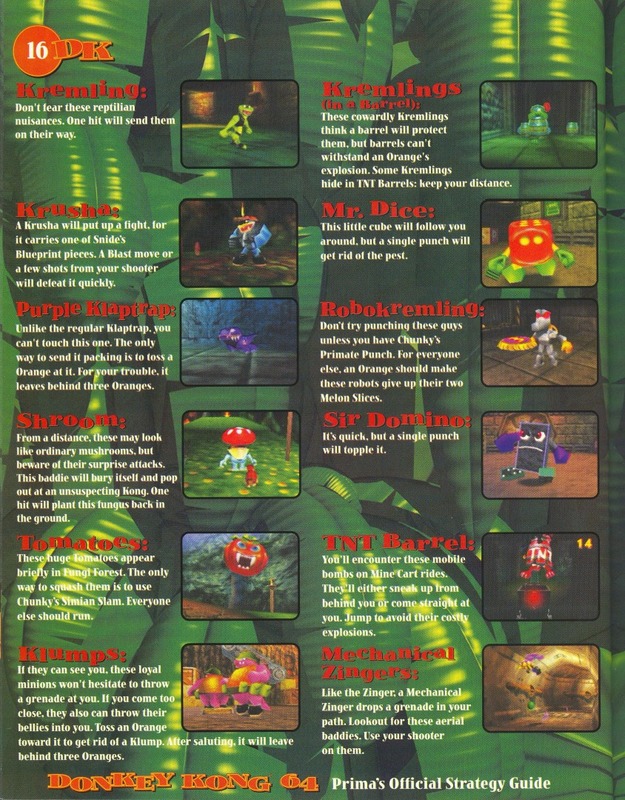 Their titular level, Klobber Karnage, also reappears but with an entirely different layout. Klobbers appear in "The Baddies" category of the end credits. Green Klobbers and Kabooms also return in Donkey Kong 64. They are uncommon enemies, and are only found in parts of Angry Aztec, Gloomy Galleon, and Crystal Caves. This time, Klobbers shout a sound akin to "C'mon" when encountered and can damage the active Kong by running into them or if they attempt direct attacks to them. Klobbers can be defeated from the shockwave attack, an Orange, or a musical instrument move. In addition, Klobbers are no longer wearing hoop earrings as their small ears were removed. In Donkey Konga 2, Klobbers make a cameo appearance in the Freestyle Zone as one of the characters whose artwork briefly displays on-screen while the player hits the beats. Klobbers reappear in DK: Jungle Climber. In this game, they climb on Pegs and they try to bounce into the Kongs. Only two Klobbers appear in the game, in the Spooky Woods area. They appear in a very foggy area, and the player must look at the map on the bottom screen to refer to their location on the Peg Boards. This page was last edited on April 2, 2019, at 15:24.